Granted, the slogan “good mood food” is already taken, but if Arby’s hadn’t thought of it first…it could be aptly tied to Thai food…the best kind of comfort food I know. No matter what life experience you’re going through, Thai food provides a complimentary flavor fit for your mindset with a sublime blend of sweet, spicy or sour flavors that actually brightens your mood as you’re eating. I used to devour it daily a few years ago and marveled at the positive emotional effect if had on me personally no matter what my state was. Thai Village, at 81st and S. Lewis, is my all time favorite Thai restaurant in T-town. Looking in, you may think it’s a hole-in-the-wall nothing of a place, but large windows really open up the small layout and bring in a lot of natural light to the seating area. Seeing what you’re eating is a huge part of a foodie’s joy, so I’m all for letting in the light as the first priority of any décor. 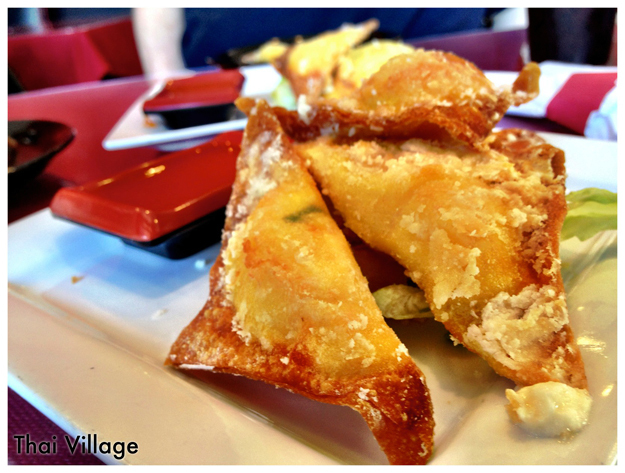 Walk in Thai Village and be seated wherever you’d like and grab an appetizer to start: Crispy sweet fried crab wontons are a great option. I ask for mine well done and always add a little spicy Sriracha sauce to get my taste buds going. These crab wontons are superb as is…but cooking them a little longer in the fryer, seems to kick them up a notch with an added touch of crispness. Call it what you will, a guilty pleasure I suppose, but there’s something about that sweet and spicy crispy combo that has me downing an order before I take my first sip of ice tea. 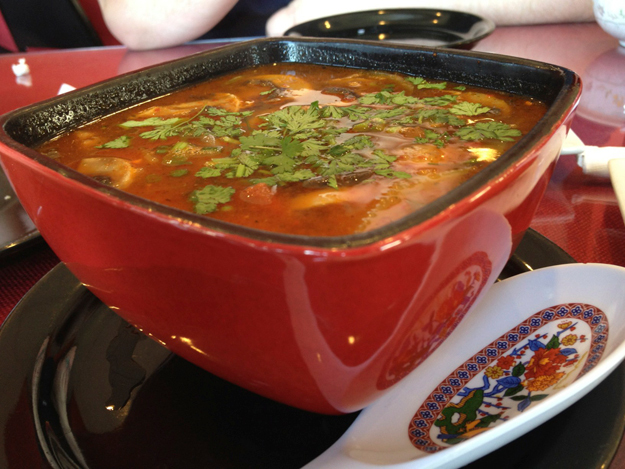 My second course at Thai Village is always the Tom Yum soup. This soup gets me through the cold months in Tulsa. A perfect blend of savory ingredients that will do wonders for your spice craving taste buds. It’s a great setup for my usual Pad Thai Curry that I order for my main course. 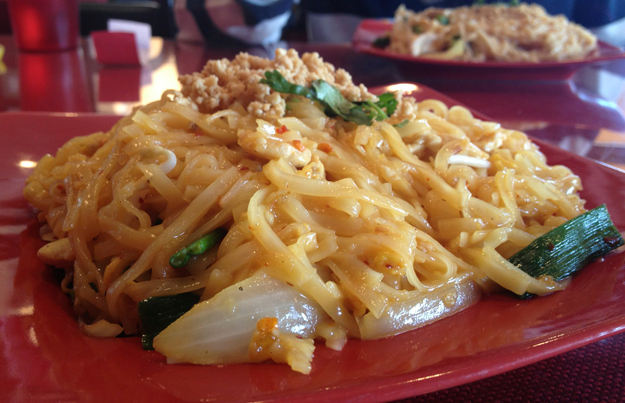 I’ve always been impressed with the level of spiciness Thai Village can provide, and Pad Thai Curry doesn’t disappoint. Everytime I order it, the auditory stimuli of just saying the name has me salivating like Pavlov’s dog. It’s hotter than hot but still maintains a beautiful subtlety of peanut butter and curry that will make you wonder how you got through life without it. Really delicious and exquisitely prepared. If ever you’re craving truly “good mood food” that is authentic, the right level of spiciness… and truly exceptional…I would definitely recommend dropping into Thai Village and giving my 3 course lineup a try..
It’s the ideal place for beginning your culinary therapy…just tell them the doctor prescribed it. Truly Good Mood Food at its best. TulsaFood.com was founded in 2008 out of a shared love of good food. What started as a blog where normal everyday people dined out and posted about their experiences has grown into a full-scale food publication with professional chefs, writers, and photographers, each with a unique culinary and educational background to pull from. Today TulsaFood.com is Oklahoma's #1 online food publication.